While I was on my OE in my 20s I visited my cousin who was an exchange student in Italy. We spent the evening with her host family, who served us up a variety of pizzas. If I had not eaten corn and potato pizza in Italy, I would not have thought it was authentic! Miss 6 gobbled this up and it must have been tasty because she insisted it had bacon on it, but it is entirely vegetarian. I have no idea if this is an authentic version, the original eating experience was 12 years ago now, but my family enjoyed it! You could use bought bases, but this recipe is sooo easy and quick! Mix the water, sugar, yeast and oil together and stand, covered until frothy, about 10 mins. Grease an oven tray. Turn oven to 200 C fan bake. While this is happening prepare the pizza toppings. 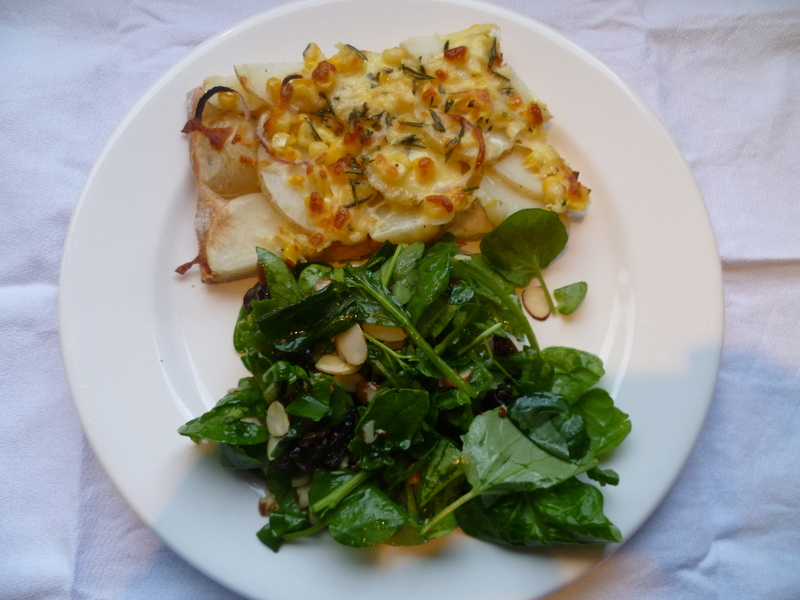 Slice the potato VERY thinly (if it is too thick you will have crunchy raw potato as it isn’t in the oven long). Cut the kernels off the corn, grate the cheese, slice the onion thinly and chop the rosemary. Once the water and yeast is frothy pour it into a large bowl (if it isn’t in one already) and mix in flour and baking powder. Pour onto a floured bench or board and knead briefly to make into a dough. Roll out the dough thinly on a floured surface to fit the oven tray – it should cover most of the tray if rolled thinly. Top with the potato by making a circle of slices on the edge of the pizza and working your way inwards. Overlap each circle very slightly. Top with corn, then onion, then cheese, then rosemary and salt. Bake in the oven for 12 mins. I would check after 10 mins as each oven is slightly different and you don’t want dark brown edges! You want the top to be golden, the whole base to be cooked through and the potato to not be raw. Drain the juice through your slightly opened fingers to avoid getting the pips in it – like a built in sieve. Serve pizza with salad on the side (see note on kids and veges below). Note on veges and kids and corn in the microwave: There is no way my girls would eat this salad. One of the challenges of cooking for kids is that there are often limited vegetable options they will eat and they get pretty boring after a while! Miss 6 will eat most veges including lettuce salad, Miss 4 has a more limited list. I can generally get her to try things, but not eat copious amounts of new vegetables, and all raw veges except for cucumber get spat out after she has chewed them for a while! I served my girls up half a a cob of corn with the pizza. If you remove tassels off a cob of corn (but keep the husk on) and put it in the microwave for 3 mins on high it will cook perfectly (you may need to experiment with the length of time if your microwave is less or more powerful than ours). Thanks for sharing Sara, I am going to give this one a go…..I might even be brave enough to make the base…but I.’ll see!